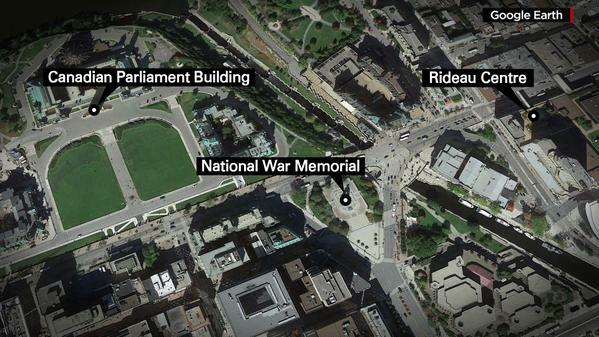 Multiple shootings at a Canadian parliament building and the National War Memorial in Ottawa left two dead. The victim and suspect have been identified. A soldier was killed and a suspected gunman is dead following a series of shootings Wednesday morning in and around the Canadian Parliament in Ottawa. The Ottawa police confirmed to BuzzFeed News that there were two separate shootings: one at the National War Memorial and one on Parliament Hill. The police had previously reported a third shooting outside the Rideau Centre mall, but retracted that statement. A spokesperson for the police department told BuzzFeed News that they received many 911 calls reporting shots heard from the mall area, but the witnesses were actually hearing the gunfire from the nearby war memorial. A member of the Canadian Forces who was guarding the National War Memorial was shot and killed in the gunfire, police confirmed. The soldier is reportedly a 24-year-old Canadian named Nathan Cirillo, pictured below. A suspect was killed, although police are not yet releasing details of his death. 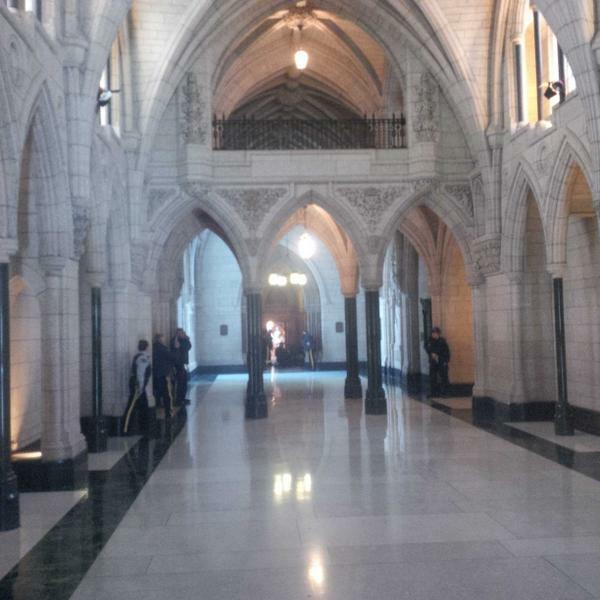 Canada's Minister of Justice Peter MacKay credited Sergeant-at-Arms Kevin Vickers with stopping the shooter. According to Veterans Affairs Minister Julian Fantino, Vickers (seen above carrying a ceremonial scepter) shot and killed one of the suspects. Ottawa police spokesman Chuck Benoit told the Associated Press that police suspected there were one or two other gunmen involved. In a phone call with BuzzFeed News, a police spokesperson clarified that they "always go with the assumption that there is more than one shooter involved, until we get concrete information proving otherwise." At this time, no other suspects are in custody. The deceased gunman was identified as 32-year-old Canadian resident Michael Zehaf-Bibeau, who was allegedly a recent convert to Islam who had previously used the name Michael Joseph Hall. A Canadian hospital confirmed it received three patients from the shootings. CBC is reporting that all three patients have since been released. The violence led to speculation of a coordinated terrorist attack, since earlier this week two Canadian soldiers were killed in a hit-and-run that police say was "fired up with radical Muslim fervor," the AP reported. Ottawa Mayor Jim Watson called the events "a sad and tragic day for our city and our country," adding that it was a tragedy with "origins as yet not fully known, causes not yet fully understood." Police would not confirm the names of the deceased because they are still in the process of notifying the next of kin. "Let there be no misunderstanding, we will not be intimidated. Canada will never be intimidated," Harper said of Wednesday's terror attack. Instead he said it would only "strengthen our resolve." Speaking of those behind the terror attack, Harper added: "They will have no safe haven." An Ottawa police officer attempts to clear people from an area on Metcalfe Street. Witnesses told the Ottawa Citizen that two men got out of a car in front of the National War Memorial just before 10 a.m. One held a rifle, and opened fire at the soldiers stationed in front of the monument, the witnesses said. A Canadian soldier who was shot outside the war memorial. 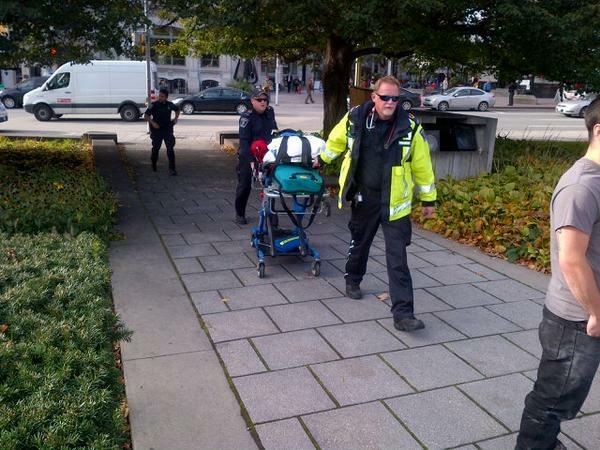 Cirillo was shot in the abdomen and later died in a nearby hospital. Ambulance arrives to take wounded soldier away. Looks like one of the soldiers on guard at the war memorial was shot. Witnesses said that after the shooting, one of the men got back into the car and drove up the street to Parliament Hill, where there were reports of shots being fired both inside and outside the building. Witness says this is the suspect&#x27;s car. He says two men climbed out. No licence plates on it. Witness says this is the suspect's car. He says two men climbed out. No licence plates on it. In a video released by the Globe & Mail, more than 10 gunshots can be heard from inside the parliament building. Witnesses said they heard between 30 to 50 shots fired. 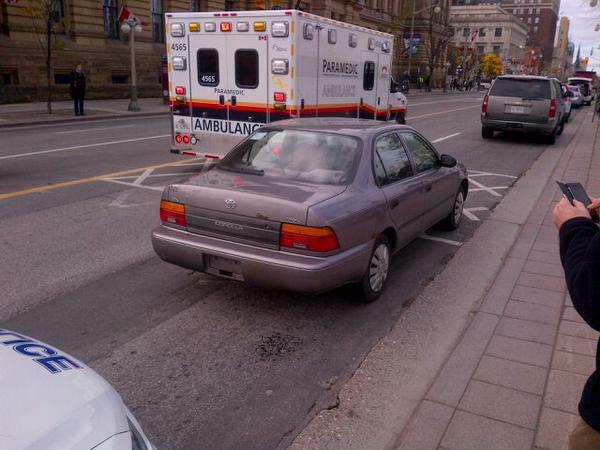 Ottawa police confirmed to BuzzFeed News that there were also shots fired outside of Parliament Hill. All government buildings were put in lockdown. People in the Conservative Party caucus room barred the doors with chairs. The Conservative Party caucus room is shown shortly after shooting began on Parliament Hill, in Ottawa, Ontario, Oct. 22. Conservative caucus is locked down in its caucus room, Parliament building is being searched. A member of Parliament tweeted at 10:30 a.m. ET that one gunman had been shot and killed by police. Officer confirms shooter still on the loose. Prime Minister Stephen Harper had been inside Parliament when the first shots were fired, but was evacuated to a safe, undisclosed location. President Obama has been briefed on the situation, but there have not been drastic security increases in the United States. Obama called the shootings "outrageous," and in a telephone call with the Canadian prime minister, he offered U.S. assistance and stressed that the American people are in solidarity with Canada. POTUS has been briefed on shooting incident in Ottawa, WH officials confirm. NORAD tells BuzzFeed News it is &#x201CC;oordinating w our Canadian counterparts,&#x201D; but no official steps to increase security posture so far. NORAD tells BuzzFeed News it is ??? ?oordinating w our Canadian counterparts, but no official steps to increase security posture so far. (Ottawa)—The Ottawa Police Service and Royal Canadian Mounted Police (RCMP) responded to reports of shooting incidents this morning in the downtown area. 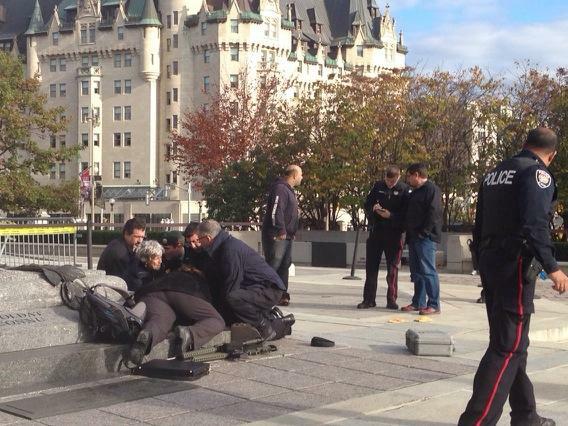 Police can now confirm that incidents occurred at the National War Memorial and on Parliament Hill. Contrary to earlier reports no incident occurred near the Rideau Centre. Next of kin notification is underway and as such, the victim's identification will not be released. One male suspect has also been confirmed deceased. There is no further update on injuries at this time. This is an ongoing joint police operation and there is no one in custody at this time. Ottawa residents are asked to stay away from the downtown area while the investigation continues. If you work in one of the downtown buildings, follow the instructions from the building management you are in. A number of RCMP and Federal government buildings are also closed to the public; as is Ottawa City Hall and all Ottawa Police stations. The Ottawa Police Service wants to speak to witnesses of today's shooting incidents. Witnesses are to call Ottawa Police at 613-236-1222, ext 5493. Those with tips regarding the shooting incidents, or those looking to report suspicious activity, can call 613-236-1222 or call 9-1-1. Anonymous tips can be submitted by calling Crime Stoppers at 613-233-8477(TIPS), toll free at 1-800-222-8477 or by downloading the Ottawa Police iOS app. The police have asked anybody with pictures or video of the shooting to contact them. Police officers take cover near Parliament Hill. The safety perimeter around downtown Ottawa has been lifted, police said, after determining "there no longer exists a threat to public safety in the area." "However, the police operation continues on Parliament Hill and as such the Hill continues to be off limits to the public.